While working on last week’s doll clothes posts, I realized I’d forgotten to post a link for these outfits (which I posted back in August) from the Gallery Page. So today’s post may seem like a re-post, but actually, I’m updating links for my Gallery Page with this post. Here’s a link to the tutorial video that shows you how to make the felt shirts. As you’ll see in the tutorial video that goes with these patterns, you need to cut out each pattern and tape them together before using them to measure your fabric for the skirt. Here’s a link to the tutorial video that shows you how to make the skirts. 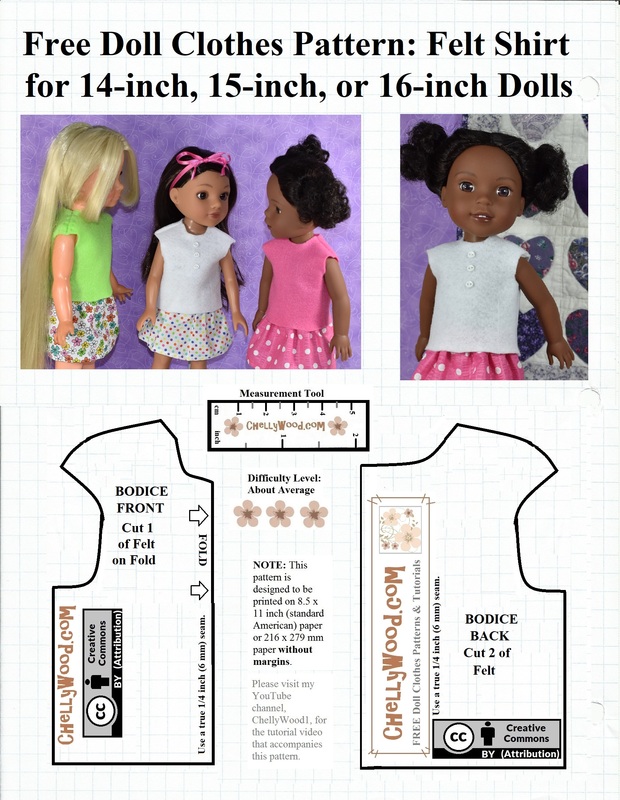 These doll clothes should fit most 14 inch, 15 inch, and 16 inch dolls including (but not limited to) the 14-inch Hearts4Hearts Girl dolls, the 15-inch Wellie Wisher dolls, and the 16-inch Crissy/Velvet dolls from Ideal toy company. Do you want to make a pair of sandals for your dolls to wear? Here’s a link to the sandal pattern for these dolls. Here’s a link to the tutorial video that shows you how to make the no-sew sandals. If you’ve never downloaded my patterns before, please visit this tutorial for help.